Presentation of the Pro-Ecclesia et Pontifice Cross to Professor John Monaghan. Picture by Shane O’Neill / Copyright Fennell Photography 2015. President Michael D. Higgins has led tributes to the Society of St Vincent de Paul’s esteemed spokesman, Professor John Monaghan, who has died aged 73. In a statement, President Higgins described the longstanding member and public face of the SVP as “a passionate advocate for the importance of education, and an ethic of care” throughout his career. He said that through his work with the Society of Saint Vincent de Paul, Professor Monaghan set “a powerful example of practical solidarity and inclusiveness, working to improve the welfare of those most in need”. John Monaghan grew up in Drimnagh in Dublin. He left school at 14 and began work as a mechanic at a local garage. He later attended Bolton Street to study to be a mechanic. In 1967, he was appointed part-time lecturer in the engineering department at the college. His career continued to blossom and he was later appointed Professor of Mechanical Engineering in Trinity College where he was also elected a Fellow in 1993. He was a Fellow of Engineers Ireland and a Chartered Engineer. He was the author/co-author of over 200 journal/conference papers and over 100 research reports. He was Awarded Hon DPhil by DIT in 2013. In addition he was awarded the William Johnson International Gold Medal for Research and Teaching in 2014. In tandem with his expertise in engineering, he was also a social policy advocate. He served on the Board of Combat Poverty Agency (2005 – 2009) and was a Member of Bishops’ Commission for Justice and Peace (2010 to 2013). John Monaghan joined the SVP in 1985 and was an active member of his SVP Conference in Leixlip, Co Kildare and a member of the National Management Council from 1996-2014 and he also served as national vice president. In a statement, the SVP said that as the media voice and face for the organisation for 15 years, “he was seen as a credible and authentic voice for SVP views on poverty, injustice and inequality”. 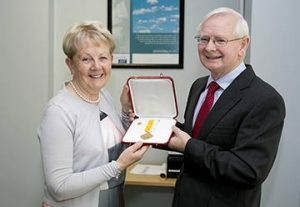 In 2014, Prof Monaghan was awarded the Pro Ecclesia et Pontifice (the highest papal honour that can be bestowed on a layperson) for his work in SVP and promoting social justice issues in Ireland.